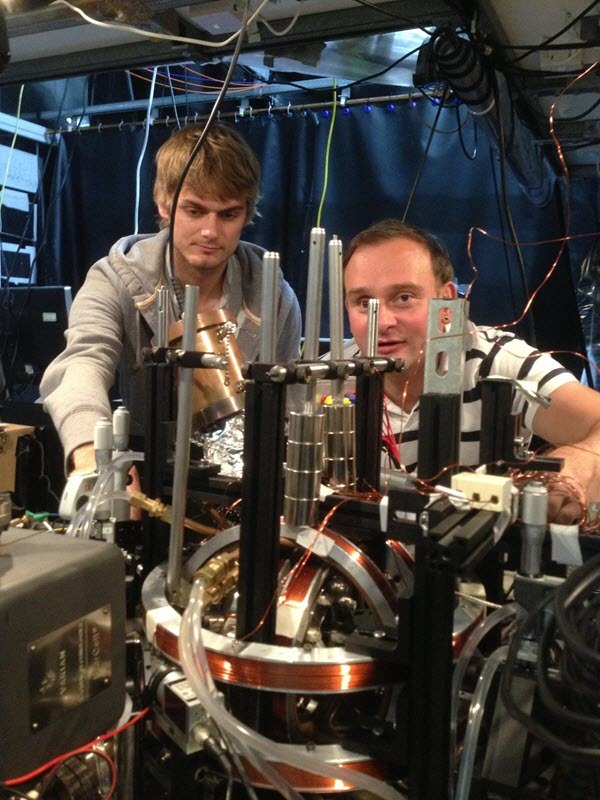 Physicists at the University of Sussex have frozen single ytterbium ions (charged atoms) to within a millionth of a degree of absolute zero (minus 273.15°C), using 12.6 GHz microwave radiation combined with a large static magnetic field gradient. Temperatures near absolute zero are required to hold ions stationary for quantum computing and other applications. The physicists measured a reduction of almost two orders of magnitude in the motional heating rate of the ion, which was confined in a Paul trap* by minimizing external electric field noise. 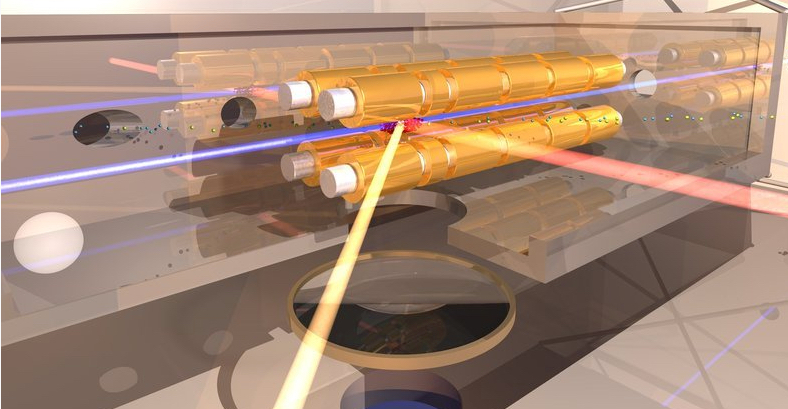 Currently, multiple highly stable, tightly focused laser beams are conventionally used in ion traps. “The use of long-wavelength radiation instead of laser technology to cool ions can tremendously simplify the construction of practical quantum technology devices,” said team leader Professor Winfried Hensinger. The report was published in Physical Review Letters this week and is available on arXiv (open access). * A Paul trap uses dynamic electric fields to trap charged particles, named in honor of Wolfgang Paul, who invented the deviceand shared the Nobel Prize in Physics in 1989 for this work. We demonstrate ground-state cooling of a trapped ion using radio-frequency (rf) radiation. This is a powerful tool for the implementation of quantum operations, where rf or microwave radiation instead of lasers is used for motional quantum state engineering. We measure a mean phonon number of n=0.13(4) after sideband cooling, corresponding to a ground-state occupation probability of 88(7)%. After preparing in the vibrational ground state, we demonstrate motional state engineering by driving Rabi oscillations between the |n=0⟩ and |n=1⟩ Fock states. We also use the ability to ground-state cool to accurately measure the motional heating rate and report a reduction by almost 2 orders of magnitude compared with our previously measured result, which we attribute to carefully eliminating sources of electrical noise in the system.